Some of the time I believe what I say. I believe that we can find Geography even in the small places. But sometimes I think: no, that’s just not right. Geography is in the mountains and the oceans, in the desert and the sky. Geography is in the hearts of explorers and in our stories of far-flung islands. Geography is the giant constellation in which we are the tiny points of light. But just as when our fathers taught us that there are three ways to melt ice, although we know now that they were wrong, when our time comes to teach our sons and daughters we teach them the same three ways. We tell them what we must. There is no point in teaching them our truths. They have to learn their own. One of the hearts of Geography is the search for a sense of place: the quest to identify, capture, record and represent the essence of a location. Japanese haiku poetry does much the same thing. Sometimes at the scale of a bug under a leaf, sometimes at the scale of a view to the distant horizon, Haiku try to capture in a succinct and tightly formalised way the essence of what a geographer would call a landscape. Early in 2011 I set the 1st years a between-tutorials task of keeping some kind of reflective diary or blog about their Geography studies every day until their next tutorial in two weeks time. It sounded like a fun and useful exercise, so I thought I’d join in… partly to show them how you might do it (an example, not a model) and partly because, well, it’s a fun and useful exercise! I asked the students to treat it as an exploration and an adventure. Looking back on it a year later I found it interesting, so I thought I’d post it here, just for the record, in case anybody wondered what kinds of things went through a Geography lecturer’s mind at work, day to day. Here are my (slightly cut down) entries. Just had one formal class today: a 1st-yr tutorial… the one where I video them giving talks for the first time. I’m keeping up the “new style” tutorials – pretty relaxed, and the students seem happy with them. This is a good group: they all did their bit, even though I know it was painful for some of them. I’d have hated it if I was still them. What am I talking about: I am still them – they just don’t recognise me. Getting them to do the reflective diary is new, but it fills a very clear need at this stage. My dog, Gus, means well and when you set him a task (like SIT and STAY) he goes to it with enthusiasm… for about 10 seconds then his mind wanders. He needs to learn some staying power. Doing something every day without fail for a fortnight might turn out to be a challenge for the students, but it’s an important thing for them to get used to. I’m really curious to see whether they take it seriously and see the point of it. I deliberately didn’t give it a big build up. I just offered it and we’ll see whether they see what a great gift it actually is. I can guess a couple that won’t bother, and a couple might miss days and try to cover up. May be I’ll turn out to skip a day! That’s another reason it’s good for the lecturer sometimes to do the work that he sets the students: how can I fairly judge them if I haven’t actually had a go myself? Having said that, most of my life seems to be about writing reflective diaries. In other news: Routledge are asking whether we want to do an update to our bestselling -How to do your dissertations- book (hmmm, may be), the U.S, National Science Foundation want me to referee a grant proposal (sorry guys, too busy just now), Earth Science Reviews want me to referee a paper about permafrost (oh, OK), and a publisher from Romania that I’ve never heard of wants me to write something in a new Geomorphology book they’re producing (er… I’ve never heard of you!). Spent a lot of time over the last couple of days preparing Friday’s Inspirational Landscapes lecture, met with RIW to discuss next week’s practicals… uh oh, this is becoming a list of what I did, not a reflective diary. Poor example for students. Reflection on today: students did good work, and I should give some thought as to whether it was anything I did in course design or strategy that helped them to do so. Perhaps I should ask them? Did “video their talks” tutorial for the second group today, and was pleased again that all the students who turned up had clearly put in some work and made a good effort. Some of them were clearly nervous and I was impressed with their bravery. It’s another example of the kind of problem that anonymous marking throws up: different students deserve credit for different aspects of each task. Obviously these talks aren’t anonymous, of course, so the problem doesn’t arise here, but I do feel with other work that is anonymously marked that we are prevented from giving students all the credit they deserve. This afternoon’s Inspirational Landscapes lecture was one that I always think should be great, but somehow always disappoints in one way or another. I think some of the students “got” what I was on about, and there were some good in-discussion contributions, but there was a group who didn’t seem to be quite on the same page and didn’t seem to want to explore the ideas I was throwing up for them. They really seemed to struggle with the task of seeing familiar things from a new angle, and reacted to the challenge by becoming dismissive, almost as though they were thinking “Oh, I haven’t thought in that way before, it must be rubbish”. I sometimes wonder whether there should be an entry test for this module, based on open mindedness and curiosity. How would you quantify and test that? At a superficial first thought I might say I haven’t done much academic work today. Sure, I’ve answered a few student queries by e-mail, but so far that’s about it. Superficial first thoughts can be misleading, though. It’s important to be able to work in the background while doing other things. If you have a problem or a topic sitting just behind your front-of-mind thoughts, something you’ve put back there to be dealt with later, then it tends to pop up quietly through the day whenever you see anything that’s relevant to it, and your ideas can move forward on it without having to actually set aside time to “work” on it. So today I have all those “big projects” just simmering quietly where I can keep half an eye on them and stir them occasionally. I wonder whether students would do much better if they could master that skill. A lot of them seem to think that you are either “working” or “not working” and don’t seem to see that you can work effortlessly in the back of your mind while doing whatever else you want to do. You can actually do a lot of good work while you sleep. That’s why students who don’t sleep enough do badly. I find that if I do that, then when I eventually do sit down to finish off a particular job (like the lecture that I’m deliberately not working on today), it will suddenly seem very simple, because my mind worked it all out while I didn’t think I was looking. So, I may not seem to working today, but the back of my mind is working while I’m not looking! I was saying to the 3rd-year Inspirational Landscape students yesterday that Geography is a curse: once you have seen how it works you can’t look at anything without “Geography” waving back at you. When you start to notice the geography in everything then you can count almost anything as work! I started the previous entry saying that it was “today’s entry”. In a reflective diary like this it’s sometimes good to set aside one point in each day to think back over what you’ve done, but it’s sometimes good to keep a running report as the day goes along. I keep notebooks all over the place and am rarely without either a pen and paper or at least some gadget where I can record a thought before it slips away. When I set this task for students I said they could do it as haiku if they wanted. I’ve been thinking a lot recently about using haiku in teaching. Haiku are great for encouraging concise and precise writing, and they are also good for training students to look carefully and notice things. I spoke to the 3rd-yrs on Friday about how the best way to make yourself really look closely at something was to give yourself the task of representing it or recreating it in some way. For example, by making a model, doing a drawing… or writing a poem. Look really hard and write what you see. The first attempt will be trivial, so look deeper… repeat until you are seeing things you never noticed before. I really like the idea of Geographical Haiku. Yes, of course all genuine Haiku are geographical in that they refer to an aspect of the natural environment, but I’d really like to develop haiku that refer to a specific location and could be geotagged on google earth. I could set students an exercise to write about their home area, or a place they visited, and plot the poems up onto a big map. May be such a thing already exists in google earth… may be one of my excellent students will read this, seek it out and let me know. Meanwhile I put a few up on twitter now and again. What do you see when you look out of the window? I see 17 syllables. I started today with a mountain of tasks and now here I am, half way through it (or up it)! And the evening is yet young, hey ho. Unfortunately one of today’s tasks was telling a student that I was disappointed in him. I wonder whether students believe me when I say I really want them to do well or that I am disappointed when they let themselves (and me) down. Do they understand how much lecturers can really want students to make the most of the opportunity that they have here? I wrote a reference for a former student today and was able to say how she had really lived up to the faith we’d put in her: she worked hard, did well, and put her studies to good use. You remember students like that. I’m still in touch with students from when I first started teaching in 1987, and I still remember their strengths (and weaknesses) as students, even though they have now grown well past those and are in their 40s. Another thing I’ve been thinking about today is how students often ask for things that are actually bad for them. For example, students often say things like “can you tell me which pages I should read?” when the whole point of the exercise is for them to go through the experience of DECIDING which pages to read. Sure, I can tell you, but then you miss the whole point of being here. If you want an intellectually easy life and don’t want to do the work necessary to improve yourself, you might be better advised to consider an alternative path! Somebody on Twitter last week asked “what makes a geographer?”. A student in their reflective blog this week said how they were increasingly seeing geography all around them. So, I’m thinking that what makes a geographer is seeing the geography around you, and not being able to stop thinking geography! 2nd-yr prac went quite well today… students seemed to be getting something out of it. Must catch one and squeeze feedback from them. One of the best things and the worst things about my job is the flexibility. It’s great that I could take today away from Keele to do some nice not-work stuff, but on the other hand the flexibility means that you never “finish” your day’s work just because the clock reaches a certain point, and if you keep your e-mail running you find yourself getting queries from students while you’re eating your tea. Hmmm. Banana sandwich, anyone? I make a lot of extra work for myself with some of the unusual exercises I set for students. I really enjoy keeping up with WebCT discussions, or with the reflective diaries of the students who are posting them daily online just now, but if you count it as work then it certainly adds in extra time when I’m not getting on with writing the talk I have to give to a group of visitors tomorrow! Time management is crucial, and becomes more important the more you have to do. Perhaps a good way to teach students time management, rather than “explaining” it to them, would be to quadruple their workload and give them two essays a week. That’s what we got when I was a student. When I was a lad… …and look how I turned out: yet again writing a talk the night before it’s due to be presented. D’oh! It’s actually been a longrunning discussion since I started teaching: throw them in at the deep end or let them in gradually. Swinging pendulums, and I’m erring back towards the short sharp sit up and grow up approach. I need some hyphens in there, but I need my banana sandwich even more. One of my jobs today was to give a 1-hour “looking at landscape” session to a visiting group of asylum seekers as part of Keele’s internationalisation program. There were many interesting comparisons between “regular” students and this group, one of which was how polite the visitors were today, and how nicely they all said hello as they arrived and said thank you and good bye as they left. They clearly weren’t taking the session for granted as so many “regular” students seem to. I wonder if students realise how much work goes into some of the sessions we give, that they roll into half asleep, chatter through without making the effort to join in with discussion time, and stroll out of, eyes to the floor, without a word of recognition or appreciation. Not that I’m moaning or anything. I’m just saying. It was nice to have a really polite and interested group of “students” who really seemed to be enjoying what we were doing. Why don’t regular students come across that way? This is the first time I’ve run this particular exercise with students, and while I certainly think it has potential and could be really useful to them it also needs a few tweaks. For example, it’s nice giving students total freedom to do it however they like (web, paper, VLE, etc) but now of course some are being highly visible and public while others are unseen and untrackable. It would be nice to have some degree of common sharing at this stage, so perhaps I should have at least defined a shared venue for postings, such as the VLE. Also, using the VLE would reduce the risk of students making public comments about my colleagues, which would be inappropriate I guess. The posts I’ve seen so far from the “public” students have been great, although they don’t all seem to have understood what is meant by “reflective”. Something to reflect on together in the next tutorial, perhaps. I’ve been very pleased to get diary updates from lots of students today, and have enjoyed seeing their entries. It really gives me (and I hope them, too) an insight into how they are approaching the course. Some seem to be underestimating how much work they need to do to keep up with a degree course, while others are engaging really well. As always it’s a mixed bag, and part of my job is work with each student according to their needs. I’ve also been getting some input from 3rd-years on a different discussion, and it’s interesting to think how students change their views (or not) as they go through the course. Some students really grow and open up their attitudes as they work through the programme. Some don’t, of course, which I think is a real shame. What, after all, is the point of University? I think I put a reasonable weight on that side of the “teaching” but it’s hard to get the right balance. I suspect I focus more on the “big picture” than most of my colleagues do, but that might be because of my particular perspective on Geography, teaching and University. I remember I used to be very pleased sometimes when I remembered all my qualifications and prizes because it reassured me that my approach and opinions must have some merit! That’s one reason it was also nice to get the NTF a few years ago. I suppose I should also take it as a reminder that saying “well done” to a student is as important as saying “change this”. Long day at the open day today. Amongst other things the open day is a good opportunity to speak to a different kind of audience: a bit younger (the applicants) and a lot older (their parents etc) than the usual student groups I mainly talk to. I ran a new “tutorial type” Inspirational Landscapes demo teaching session for them today, and was pleased that both the parents and even some of the applicants were brave enough to speak up in “discussion”. It made me wonder again what it is that happens to many students in that brief window while they are students, to make them so reluctant! Perhaps students should be made to take a 3-year gap between school and university, coming back when they are ready to get the most out of it. On some TV show last night one character complained about having to deal with a teenager: “teenagers are slow witted” she said. Of course my students are not at all slow witted, but certainly younger and older groups seem to get much more visible satisfaction out of my “classes”. It was great today when some bloke about my age came up after the Inspirational Landscapes demo lecture and said that after just half an hour of Geography he really looked at the world differently! We should bottle the stuff and sell it on t’internet. Reflective, perhaps, but less effective today than I hoped to be. Suffering from the typical student problem of distractions and poor focus I have done only part of one of the two big jobs that were on my plate for the day, but have spent a lot longer than I intended dealing with little things that kept cropping up. A student last week commented that lecturers find it easy to lecture, but in fact it’s probably useful for students to realise that we find things as hard as they do. We try to be a good example not by “being good at things” but by “being willing to work at things and try hard” even if they are difficult. I too get distracted by Twitter and Facebook and the cats and dogs and having to wash the car and doing family things and helping the lady next door when she runs out of milk. I, too, want to stop work so I can watch TV instead. We’re not immune. So that means that we do indeed, to some extent (even though some of us are so ancient) have at least some idea of what it’s like being a student. So our advice is informed by an understanding of at least some of your reality. On the other hand, some student realities continue to surprise me. Student: “Are all clouds formed the same way? I don’t know how to find out… help me!” Me: “Yes they are: try looking in a meteorology book.” Student: “A meteorology book? I hadn’t thought of that! !” Me: “…sigh…”. And tomorrow we have a tutorial to discuss these reflective diaries. The American writer Austin Kleon, who wrote “Newspaper Blackout”, has also written a book called “Steal Like an Artist”, so I am hoping that he won’t mind that I have stolen his idea to help teach my Geography students. The picture here from Kleon’s website http://www.austinkleon.com illustrates what he does. So how do I use this teaching Geography? The point I’m trying to make with the students is that Science is a way of exploring and understanding the world, but that there are other ways of exploring and understanding the world, and that sometimes those different approaches can help each other out. For example, as a Geographer you might often want to look closely at the world around you to see details that will help you to describe, understand and represent the way the world works. Science is one way of doing that. But I learned from my friend and colleague the artist Miriam Burke that a good way of forcing yourself to look carefully at something is to try to make art about it. Trying to make a picture or a model or a poem of something really makes you look closely at it. Art is a great way of exploring. That’s why, for me, art and Geography go nicely side by side. So I took a copy of the first page of one of the basic course textbooks (“Geography – a Very Short Introduction” by J.A.Matthews and D.T.Herbert, 2008) and I started crossing out words. I asked the students to do the same. Now I’m sure there’s a whole psycho-pedagogic discourse on the traumatic consequences of making students cross out swathes of their text book. We’ll save that for a different blog. The point I want to record here is about how asking students to cross out most of the words in a page from the textbook makes them look much more closely at the original source than if we just asked them to read it. 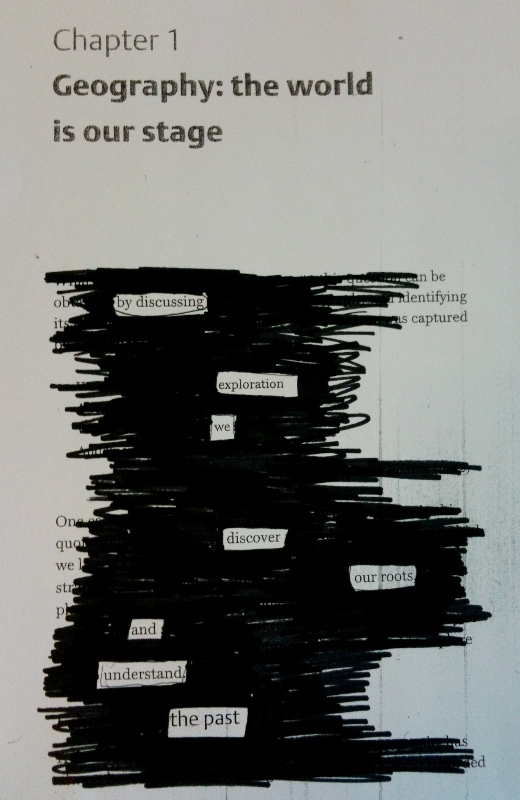 And if we insist that their Blackout Poem reflects the underlying meaning or core concept of the page they are editing (but that it must do more than simply abbreviate the content of the page), the activity seems to engage a whole new level of critical attention to the source (helping students to learn and think about the material) and at the same time switches on a creative or interpretive intellect that fixes the academic content of the original document into the mental context of the student’s own “work” on the piece. In other words, by USING the original document to create something new of their own, they get much more out of it. This illustrates something I constantly tell students: that the best way to learn something is to use it for some purpose, especially if that involves communicating it to somebody. If you are struggling to understand glacier dynamics, set a date where you have to teach glacier dynamics to somebody who knows nothing about it. It also illustrates nicely how doing something that appears to be non-academic can be a big help with your academic work. The value of play. If I can get my students to PLAY with their scientific source material… well, they’ll end up just like me! I only came up with (sorry, stole) this idea a couple of days ago, but already I see huge scope ranging from fun little tutorial activities to major coursework projects. You could even do it just for Art. 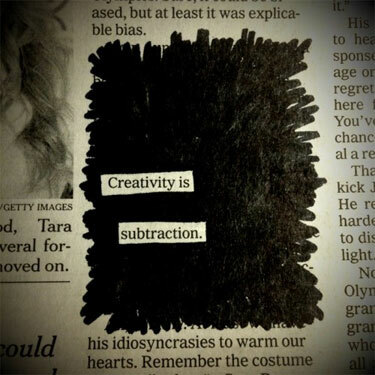 Oh, yeah, Austin Kleon already thought of that. When I tweeted my first attempt at a Geography Blackout yesterday it quickly became far and away my most retweeted tweet ever, so this seems to have struck a chord with others, too. And that’s why I thought I’d say just a little bit more about it here. For the record, here is that first attempt. My “Geography Blackout” redaction of the opening page of Matthews and Herbert (2008). I suspect there may be more to follow. Gosh, I hope nobody steals this idea. Peter Knight's "Exploration", inspired by Austin Kleon's "Newspaper Blackout" and by page 1 of "Geography - A Very Short Introduction" (Matthews and Herbert, 2008). For many of us one big reason for getting interested in Physical Geography has been an interest in the physical environment around us. Our most immediate and direct contact with the rest of the universe is through the small part of it that we can see and touch and walk around. We can experience and witness the wonders of the universe, at least in a small way, through the wonders of our own planet. The world is an amazing place, and many of us became geographers because we wanted to experience, know about, and work in the world’s great landscapes: mountains, deserts, volcanoes, glaciers… There are many elements to a landscape, from the underlying rocks to the plants that grow on them and the structures that people build, but if we strip away everything that is superficial the underlying framework of a landscape is its topography, its shape, its morphology. That is one reason why many people put geomorphology at the heart of Physical Geography. One of the reasons that some of us have been drawn especially to the geomorphology of harsh wilderness environments such as deserts, high mountains and glacial areas is that in these environments the superficial elements are swept away. Vegetation is limited. Human structures are few. The basics of the landscape, its bones, are clearly exposed. The underlying framework becomes prominent in these environments. The most valuable experience in my professional life has been to spend extended periods of time in these remote places. It has been worthwhile not only for their intrinsic interest but also because having seen landscapes with the superficial elements removed now allows me to recognise the same basic structural elements when I see them in other environments where they are largely obscured by superficial clutter. It’s easy to be amazed and say “wow” at a huge meltwater channel cutting through the frozen tundra, but very difficult even to recognise that spectacular channel when it is covered in woodland and urban development where it cuts through Stoke-on-Trent. So the first great joy of glacial geomorphology is the opportunity to see geomorphology with a special clarity in modern glacial environments where processes and landforms are very prominent in the landscape. The second great joy of glacial geomorphology is being able to transfer the clarity of vision gained in modern glacial environments to the study of ancient glacial environments such as those in the UK where the evidence is often less prominent. I often say that one of the great things about my job is the way I get a new bunch of students each year and a new opportunity to try out different ways of exploring Geography with them. Sometimes I find an approach that seems to work well and I use it year after year, tweaking it a little each year as I learn from the experiences of each group of students that try it out. And so it has come round to October again and here I am trying new versions of a couple of my old favourites: the “through the window” exercise and the “If Geography were music…” exercise. Part of the reason that it’s so handy getting a new bunch of students each year is that it enables me to do the exercises again myself. People talk about “lifelong learning” a lot nowadays, and I encourage students to carry on doing these sorts of exercises after they finish the course, but I must be an extreme example, doing these Geography-stretching exercises for myself again and again year after year and finding that they turn out a little differently each time. I have been reading Peter Franklin’s (1997) description of Theodor Adorno’s work on Mahler, in which he writes that “Adorno’s dialectical method relied on what he called a “constellation” technique, where ideas and images spiral around their subject matter, creating almost three-dimensional intellectual structures that are best grasped as totalities. Readers impatient for signposts and clearly stated goals may understandably find his writing cryptic…” Increasingly I find that my private approach to Geography, out of sight of the easily-frightened 1st-year students, is a little like that: things build up year after year into an increasingly multi-layered three-dimensional cloud or constellation of ideas, and I start to understand what I must have meant many years ago when I wrote “reality is a bundle, not a list”. And so the repeated playing of these same exercises with different students and different versions of myself creates a thick impasto palimpsest in which I can take different paths each year and look across at earlier versions of myself taking sometimes a path now less well travelled! In fact (and you will see now why I referred to the Franklin / Adorno / Mahler reading) my early steps along this year’s path into the “If Geography were music” exercise are diverging very little from those of last year. Perhaps my constellation of ideas is starting to succumb to its own gravity. Last year I used Mahler’s 2nd Symphony as my example of a piece of music that could serve as a theme tune for Physical Geography, and I gave the students a YouTube clip of Bernstein conducting Mahler 2 to help explain where I was coming from. Last night I was looking back on an online discussion that I had with the students last year, and reading one of my posts again it makes so much sense to me that I think I’ll say it again, here! Well, it’s early in the exercise so far this year, as I give the students a few weeks to think about it, so we’ll see what the students can teach me and what new ideas (and music) they can introduce me to, but for now I’m still with Mahler 2, this year as last. Another year, another symphony, but it’s Mahler 2 again! PS – If you want to join in with the discussion there’s a Twitter competition for suggestions @KeelePhysGeog. PPS – Reference: Franklin, P. (1977) “‘His fractures are the script of truth.’ – Adorno’s Mahler.” in Hefling, S.E. (ed) Mahler Studies (Cambridge). Despite the best efforts of curriculum builders in schools and universities Geography may soon cease to exist. Like a firework, some disciplines burst into existence, burn brightly, explode into a thousand tiny sparkles and then disappear. This may be no bad thing: there is a school of thought that knowledge should not be broken up into disciplines and that it is only natural for a discipline to have a lifespan of usefulness and then die off. Following up the research I was doing recently into the Oceanic Turn of the 18th Century I was drawn into looking at work on “predisciplinarity”, or how ideas were organised before there were actual academic disciplines. From there I got into the idea that there might be such a thing as postdisciplinarity: a stage when disciplines stop being useful and cease to exist. Geography as a named and labelled academic discipline isn’t actually that old, although people have been doing things that we would now call Geography more or less forever. The way that Geography can interact with so many other disciplines makes it a strong candidate for breaking up into little fragments, and I even have some colleagues who treat it as nothing but a bunch of fragments now. Of course they are wrong. There is a core, a heart to Geography that makes it much more than the sum of its component parts. Even though Geography overlaps with, and uses information from, a wide range of other disciplines, you can’t take a Historian, a Meteorologist, a Sociologist and a Geologist, shove them together in a building and call them a Geography Department! The heart, the Geography, the Geographers would be missing. It is important for Geography students to learn (and for Geography staff to remember) what that heart is. Geography may be heading in the direction of the postdisciplinary, but it would be a little premature to think it was already there. Certainly Geography is the sort of discipline that can turn down that path very easily, but I don’t think it is time yet. Geography still needs some actual Geographers. If you are teaching Geography, or if you claim to be a Geographer, just make sure you know what Geography is and that you can tell the difference between what it reaches out to and what is at its core.